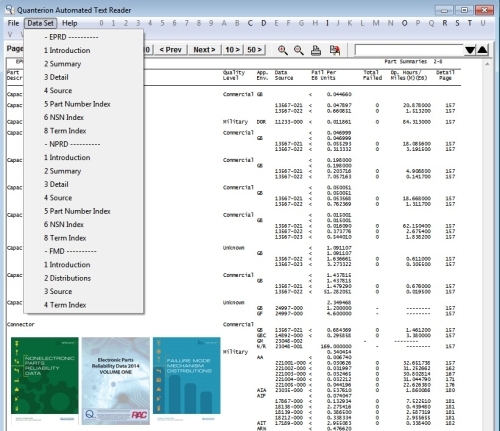 This interactive software tool provides access to all the information contained in the individual sections of the EPRD, NPRD, and FMD hard copy products. Within each individual section, the tool provides basic search and browsing capabilities that allow for locating the information of interest. Individual pages of interest can be printed for record keeping purposes or for report generation as needed. *NOTE: The Automated Text Reader is not a PDF version of the Hardcopy document. * NOTE: The Automated Text Reader is not a PDF version of the hardcopy. * NOTE: The Automated Text Reader is a Windows compatible database software tool. The tool operates in the Windows XP, Vista, 7, 8, 8.1 and 10 environments.